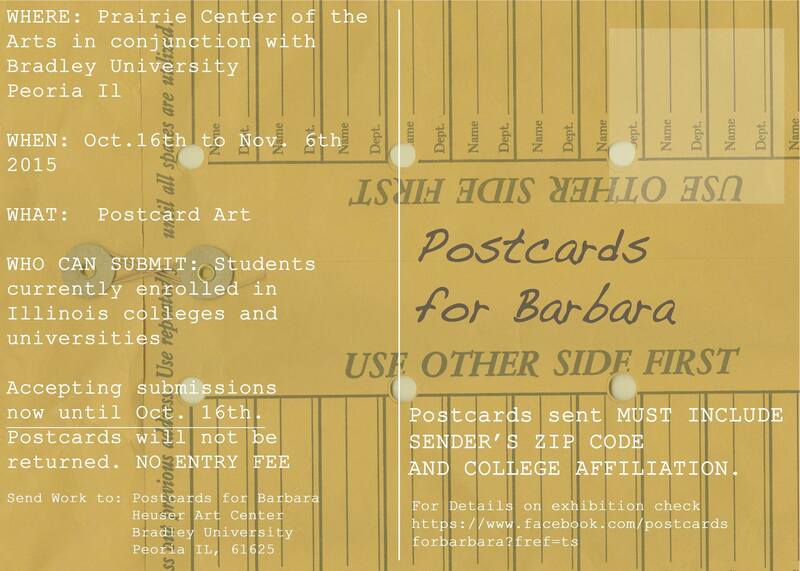 What: An exhibition hosted by Bradley University which will pay tribute to the 1979 postcard art show curated by Chicago artist Barbara Aubin. Barbara (1928-2014) was a Chicago artist who created a postcard exhibition in 1979. She invited artists from around the world to submit their postcards for inclusion in an exhibition that open at the Loyola University Water Tower Gallery and then traveled to the museums in Illinois, Wisconsin and Missouri. Where: Prairie Center of the Arts in conjunction with Bradley University in Peoria, IL. Who can Submit: Students currently enrolled in Illinois colleges and universities. Accepting submissions now until October 16th. Postcards will not be returned. NO ENTRY FEE. Postcards sent must include sender’s zip code and college affiliation.